HTB Creations: Fight Like a Girl! Happy Friday! Have you been to My Pink Stamper today to see 9 new sets? They are all awesome! 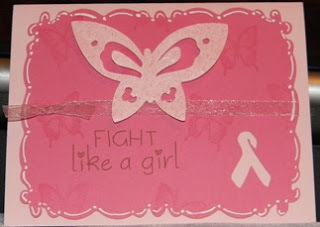 Here's a card I made for the Hope & Courage set and is over on Robyn's blog. Helen, all the cards are Beautiful, this is my favorite one. Love the Butterflies on the background, clever use of stamps. I love the Phrase "Fight like a Girl." Will be checking back throughout the day. Thanks for everything you all do & help our girl Robyn. Go Team(DT). Super card love those stamps, can't wait to decide which ones I get. Great card Helen, love the mat and stamps. Robyn has some great new releases. Thanks for sharing the inspiration.